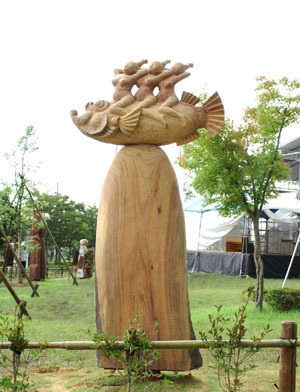 The fish of my sculpture is an imaginary fish. The people of my sculpture are women of Chinese traditional minority. This fish means man, and man and woman cooperate together to have a baby. The small life in the mother's body is ready to come out,mothers will give birth soon. And we can hear their impressive first cry. This means primitive ,eternal,great things.-The song of life..